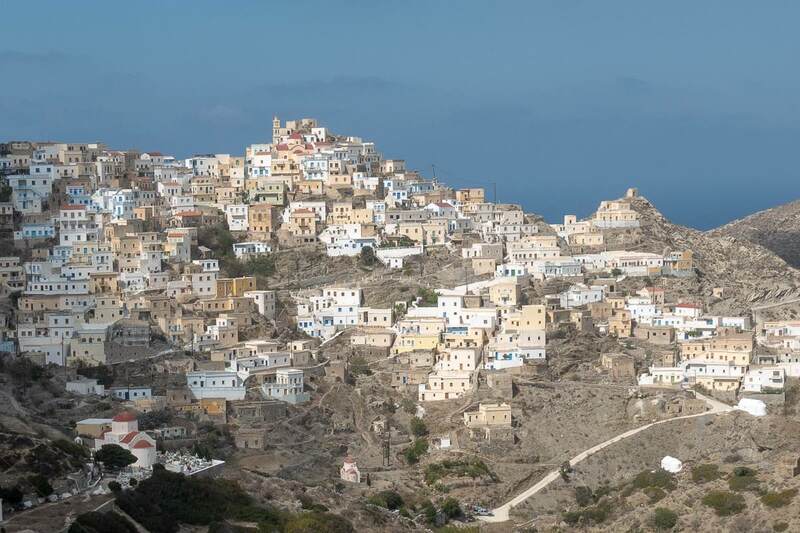 The historic town of Olympos in the mountains of northern Karpathos, where first residents could hide from pirates. Family. Togetherness. The mantra of Karpathos Island, a gem in Greece’s Dodecanese island group. The family feeling of Karpathos struck us within the first hour of our arrival. Six of us had flown from Athens and were to be picked up by our guide Michalis Reissis. His company, Holiday World Karpathos Travel, and the Municipality of Karpathos were hosting this small group for six days, in order to promote tourism to Karpathos. Michalis, though, was unable to be at the airport due to a death in the family. So we were met by Stavros, who works with Michalis and would be escorting us around the island for the week, and by Manolis, filling in for Michalis. Manolis, it turns out, was a logical substitute, as we were driven directly from the airport to his family restaurant, Rina’s, for dinner. His mother (yes, Rina!) produced prodigious amounts of food for the locals and visitors who filled the place over the dinner hours; his father kept an eye on the back room and a soccer match. Family restaurants, family tour companies, family boats, family chapels, family homes. Throughout our stay, we were invited to witness the tight family networks that keep Karpathos on track. Approaching the town of Mesochori. 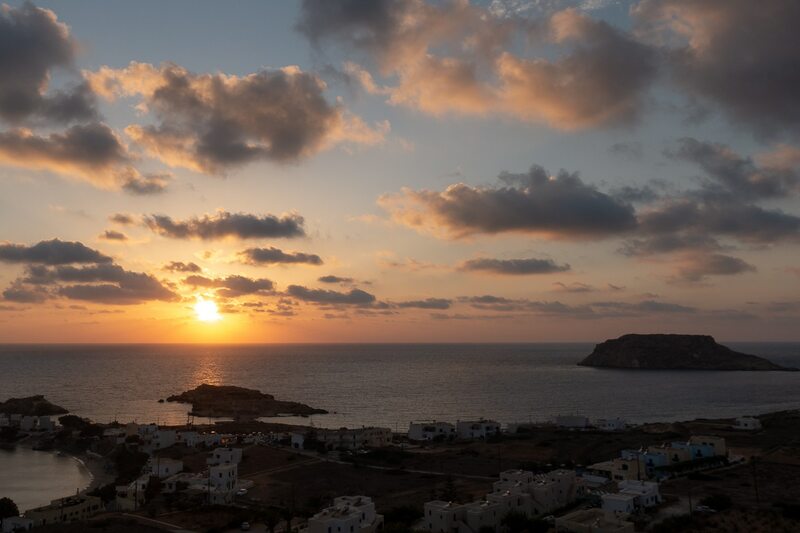 The other reason to feel so at home in Karpathos, for Americans in particular, is that it is essentially a Greek American island. Following the hardships of World War II and the ensuing economic difficulties, entire families emigrated–mostly to the United States’ east coast but also to South Africa and Australia–nearly emptying some of the island’s villages. Time and again during our visit, we were met with personal stories of our hosts’ experiences in the U.S.: in the Bronx, Brooklyn, Queens, Long Island; in Philadelphia, Baltimore, Texas. American visitors to Karpathos need not worry about getting by in Greek. English–fluent American English–is widely spoken. And while many still identify with their U.S. family, they are also interested in talking about what draws them back to the island, forever home. While tourism is a major part of the economy of Karpathos, these American investments help, too. Many divide their time seasonally between the U.S. and Karpathos. Even young families on limited budgets return annually for family gatherings and traditional festivals. In fact, the festivals are the glue which keep traditions current and families united. Though we didn’t realize it during the conversation over that first dinner at Rina’s Taverna, we were already learning about the music and poetry that surround church and social traditions, even defining who dances when and with whom. Many individuals participate–Stavros, a restaurant owner, an innkeeper–are all musicians and poets, too. Karpathos Island, for the time being, is a hidden gem, a “surprise paradise” as they put it. We know it’s among the best of all Greek destinations for its combination of history, culture, nature, scenic beauty, and beaches. Karpathos is prepared for but not overrun by tourists, and it is, above all, a place filled with people working together, families and friends, to keep the island’s unique culture intact. 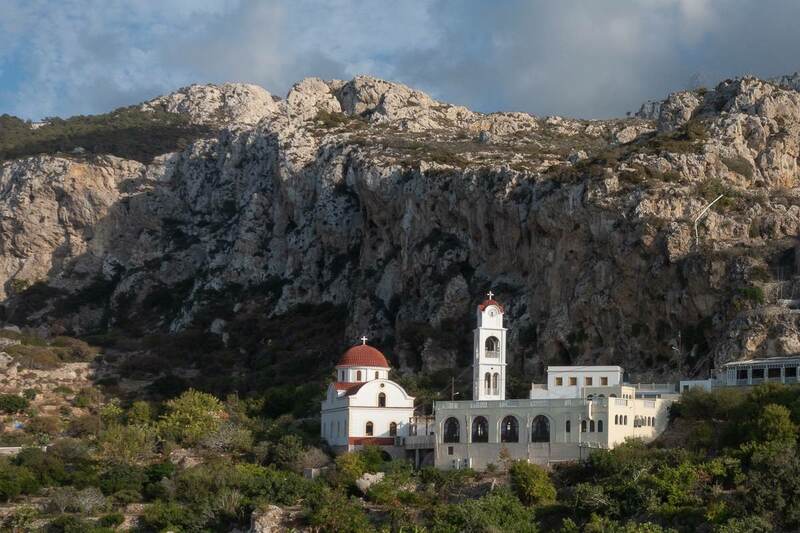 The church of Agios Zacharias in Saria, the little island once overrun by pirates. Up here are ruins of the ancient city of Argos; down below is where our boat is anchored. Karpathos, one of the Dodecanese Islands which form the southeastern edge of Greece, has benefited and suffered from its location. There are signs it was populated from about 2500 B.C. From antiquity, its people have boldly taken sides and fought in wars, dating back to siding with the Spartans in Peloponnesian War (431-404 B.C.). The island is mentioned by Homer, Pliny and others. Karpathian cities–there are four documented ancient towns–thrived from the 4th to 6th Centuries when it served as a commercial crossroads between Aegean, Turkish and Egyptian centers. But Karpathians were also victims of repeated and prolonged invasion by pirates who wielded power there for some 200 years, until 960 when Byzantine forces took over. Even in modern times, the island has been a pawn in world politics. Turks ruled during the long Ottoman hold on the islands; Italians occupied Karpathos through the first half of the 20th Century. It wasn’t until 1948 that Karpathos flew the Greek flag. Popular Apela Beach feels remote and pristine, but is accessible by car. This is one of over 70 discrete cove beaches on the island. While its geography has shaped its history, it’s also responsible for Karpathos’ current tourism appeal. It’s a caterpillar-shaped island running north and south, topped by the little island of Saria, which was split from the rest by an ancient earthquake. The province of Karpathos (combining the main island with Saria and Kasos, a populated island three miles southwest) sits neatly between Crete and Rhodes. This curved string of islands defines the outer edge of Greece and delineates the Aegean from the greater Mediterranean Sea. The year-round population is about 7000, with the majority of people living in the capital city of Pigadia on the southeastern coast. The land is mountainous and rocky, but the popular eastern beach coves are well-protected from the prevailing winds. The scenery resembles an abstract color block painting, with translucent blues out to sea, and shades of amber across pocked rocks and steep cliffs. Lying across the 35th parallel, Karpathos weather is chiefly sunny and warm, with average summer high temps of 29 C (85º F). The water is comfortably crisp, and oh-so clear. The whole island is only about 300 square kilometers (125 sq. mi. ), or roughly 48K long (30 miles) and 6K wide. Locals measure the distances in walking time. Historically–and still today–the villages identify with either their northern or southern locale. 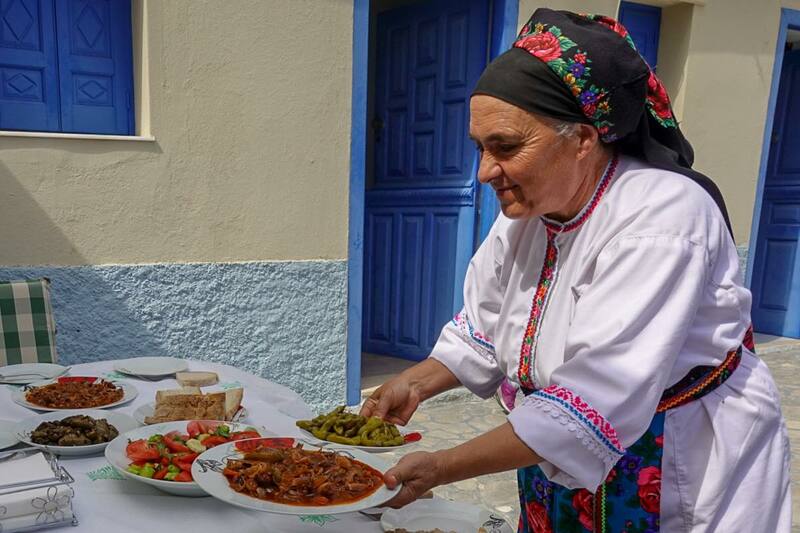 The North with the municipality of Olympos maintains a distinct culture of dress and dialect, and older women still wear the colorful traditional dress on a daily basis. The northwest area features wildlife preserves and is known for great birding based on migratory patterns. The South, where the mountains ease down into the populated coastal villages, is where the airport is located and where the port city of Pigadia is found. 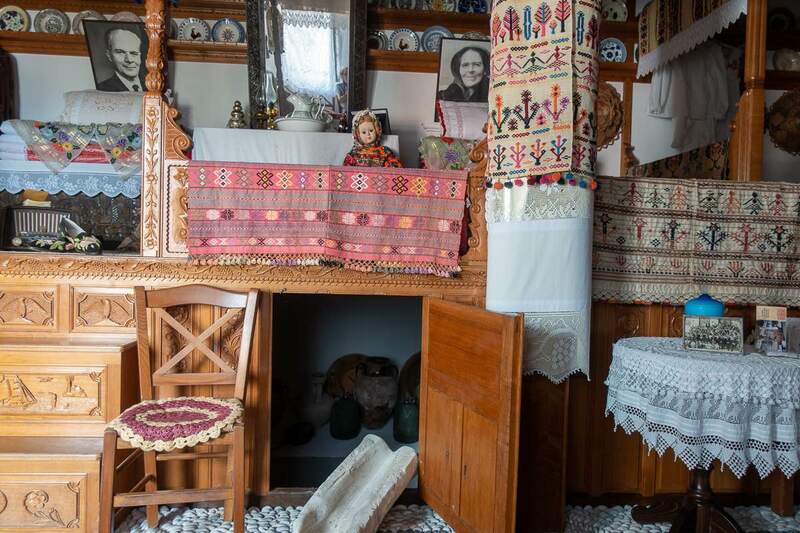 Our guide, Evangelia, and her mother, Sofia, opened their Olympos family home to us. We did our best to help while they served up salads, dolmadakia, peppers, octopus, salted sardines, and bread. While Karpathos may not be on most American travelers’ minds–and is thankfully not a big cruise ship port, yet–it’s definitely an attractive destination. The island’s already popular among European travelers, especially Dutch and Scandinavians who enjoy direct charter flights from Copenhagen or Amsterdam. Ferry service runs regularly between Karpathos and Crete and Rhodes. To and from Athens’ Pireaus port takes upwards of 18 hours, so we recommend the easy hour and a quarter flight on Olympic Air. 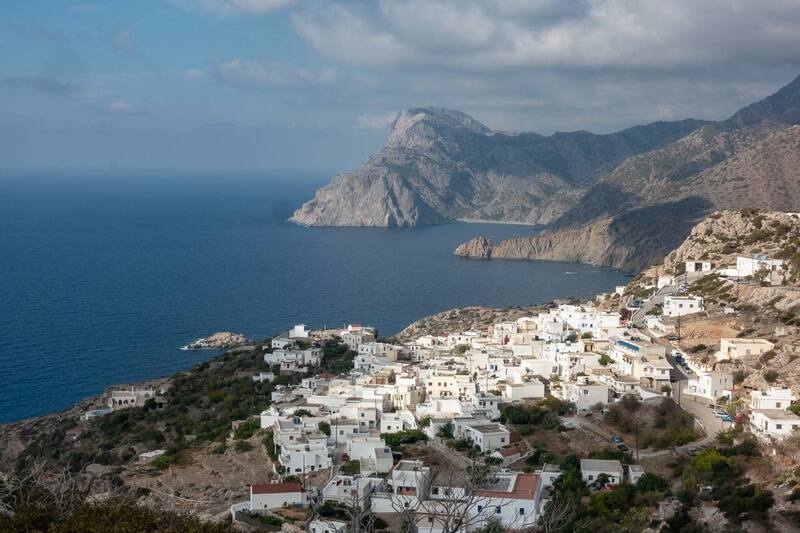 If you visit one village on Karpathos, it should be Olympos, the heart and soul of the island. It’s tucked in the mountains in the north, because it was originally a fortified retreat from the Arab, Syrian and Ottoman pirates who plagued Saria and the North in the 5th Century. Eventually, after the Byzantine overthrow of pirates in the 8th Century, the stones of the fortifications were reused to build homes and the 10th Century Church of the Virgin Mary. This historic city is still the site of the annual August 15 festival, drawing 300 people to the small church square. The community of Avlona has cultivated this valley since antiquity, providing for the remote village of Olympos and beyond. Olympos is also a great launching point for hiking the northern paths of the island. Our guide Evangelia, an Olympos native, talked about her personal project of clearing and maintaining some of the 3000-year-old hiking paths. She walked us through her town, bemoaned the fact we didn’t have more time up in the north part of the island, and took us to her family home where we met her mother and helped prepare lunch. It was a treat to share a delicious family-style meal on the patio. Nearby, the village of Avlona is a great companion visit. This small valley, cultivated since antiquity, has taken advantage of relatively level land to become the ‘bread basket’ for Olympos. The air is fragrant with pine trees. Crops eek out enough water from dew and the little seasonal rain, though we were told this year’s drought is endangering honey bees. We ate figs from a tree, spotted some remaining tomatoes on a vine, and observed the stone circles where grains are separated. The agricultural community is still active, and still relying on much manual labor and mutual assistance. Since 1995, when the port of Diafani was built, visitors have had the option to travel to Olympos from Pigadia by boat, about an hour and a half, and arrange transportation up to Olympos from the port. J. Prearis Handmade Shoes. 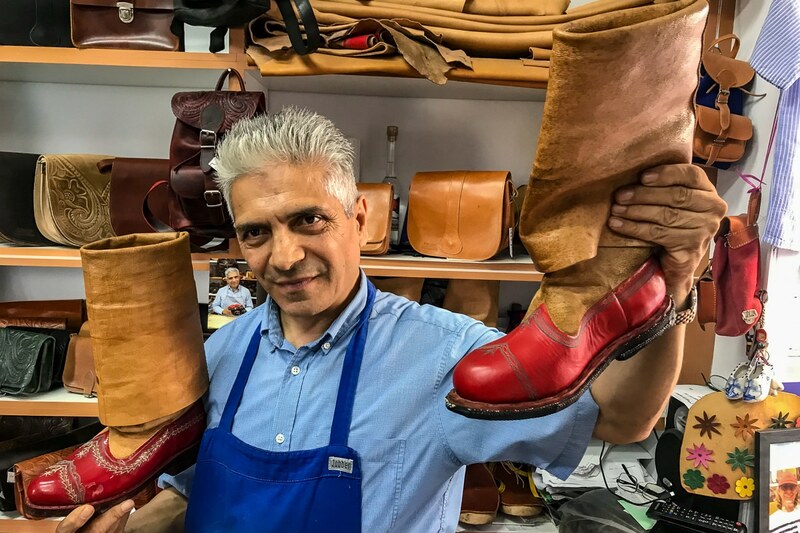 Check out the traditional shoes and boots. We couldn’t resist the sandals. If you’re lucky, you might see in the background a video of Mr. Prearis playing traditional Greek music. Giorgos Halkias Honey Shop. A visually stunning store of dozens of varieties of amber goodness. Samples offered. A day spent village-hopping showed us the inevitable changes that come to remote villages. Families with children move closer to schools; those who departed for America return only seasonally; old homes are opened as museums; a group of tourists stops by to learn about bygone days. Michalis’ commentary noted each village’s U.S. connection. Aperi (New Jersey) is today more or less a bedroom community of Pigadia. But it’s home to a large school and church, and therefore still vibrant. Some of the villas, American owned by former village families, are occupied just a few weeks per year. Othos (Australia and South Africa) is tucked into a wine producing area and features the Folklore Museum: a traditional Karpathian home. A detailed description of the interior reveals much about family life, marriages, cooking and hobbies, and aspirations. A typical plate collection reflects the family’s travel. Wood carving decorates the built-in furniture and efficient storage spaces. A pillar in honor of the father is tiered with symbolic embroidery, including dancing to connote happiness and crabs to inspire economy. Religious icons are presented by the male, who moves in to the home of his wife. The wife’s parents, then, move to the kitchen space next door when their daughter marries and has a family. An open-air agricultural museum nearby offers a view of rural life. While the home plan and décor are similar, a windmill and outbuildings demonstrate the processes used for making cheese and honey, keeping domestic animals, and harvesting grains and herbs. Pyles proudly claims 30 children now living in the village, with a total population of 140. The retention of young families with children is thanks to efforts by a local guild of women who make craft items and sell honey, beeswax, textiles, and accessories to fund each village baby. The aid for children staying in the village seems to work. (While we admired the efforts, another Karpathian noted this was just a means of tying young families to the old ways of the church. Everyone has an opinion!) The town provides a pleasant backdrop for a walk, with streets lined by pomegranate trees and cactus, and distant views of Kasos Island. The church and its water fountain are worth a visit. Mesochori This west coast town is the place to watch sunsets. Houses in this peaceful hillside city are tightly arranged. Patios stacked above each other offer panoramas to the sea…and close proximity to neighbors. From the town’s square, the cliffs and sea drop off to the west, and the prosperous Church of the Virgin Mary dominates the hills to the east. Below the church, fresh spring water flows beside a passage tunneled through the rock. The dramatic setting of Panagia Vrysiani church in Mesochori village on the west coast of Karpathos Island. Michalis tells us that when his mother was a kid about 80 children lived here. When Michalis was growing up, there were about 35 children. Now, no children live in Mesochori full time. On the way out of town, he opened a door and invited us in to see the family home of a relative. Then he promptly called his aunt to ask why her door was unlocked! Lefkos While we didn’t spend time in the town of Lefkos, we did visit St. George Church, dating to around 500 A.D., located up the mountain from the Lefkos area. The intimate church is beautiful and well preserved. As in each of our church and chapel stops, our guide tended to the candles and incense, perhaps an unconscious continuation of the ancient traditions. In contrast, the outer courtyards, recently improved and expanded, appeared ready for boisterous celebration and communal dinners. We could envision the place filled with song and dance. 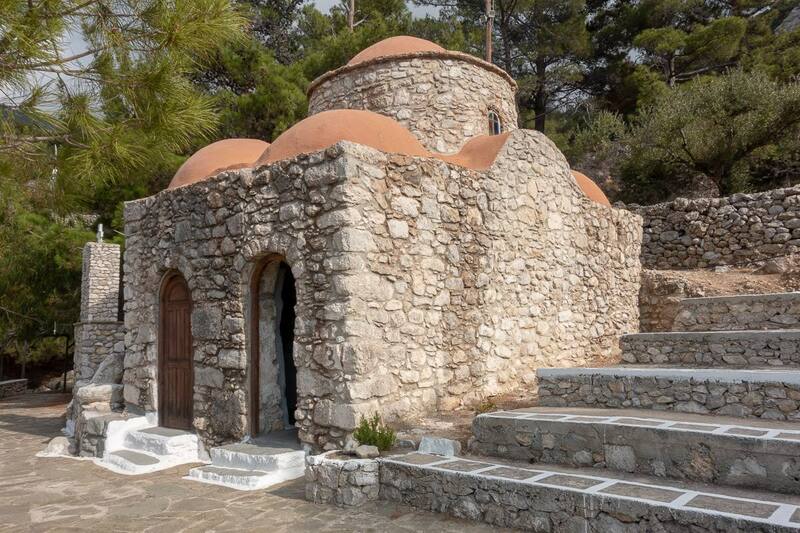 The well-maintained church of St. George, dating from 500 A.D. sits in the pine woods above Lefkos. Take a day trip by boat to Saria for a bit of antiquity, swimming, caving…and a church of course. The hour and a half hike up to the peak cuts up a ravine and leaks out onto a plateau with 180-degree views off to the north. We inhaled warm wafts of spice and onion-tinged air as we climbed, then passed through ruins of the ancient city of Argos. Actually, the Argos village was used seasonally, until recently, for agriculture, and is still the scene of an annual festival. 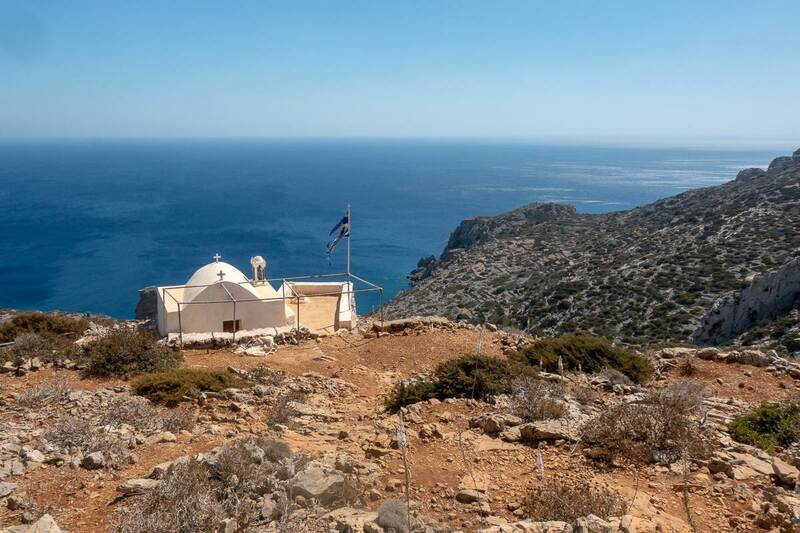 Agios Zacharias, the chapel at the top of the mountain, offers clear views out to sea and back down to the lovely natural harbor where our ship anchored. Finish the hike with a swim in the clear turquoise waters. 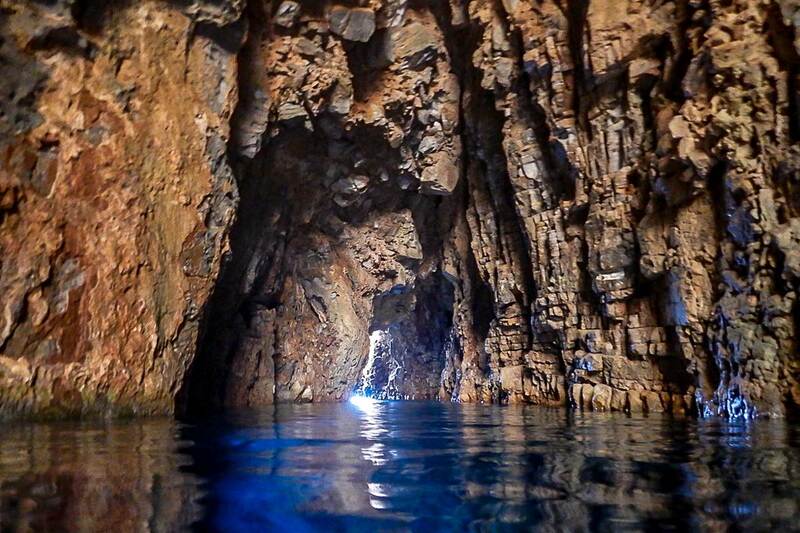 Don’t miss the chance to explore the caves on the northern edge of the cove. With a guide, our small group scrambled and swam into a large, sky-lit room, and exited through a narrow channel. Luscious. Swimming through a cave off the coast of Saria. Another tour up the east coast took us to some of Karpathos’ best beaches. 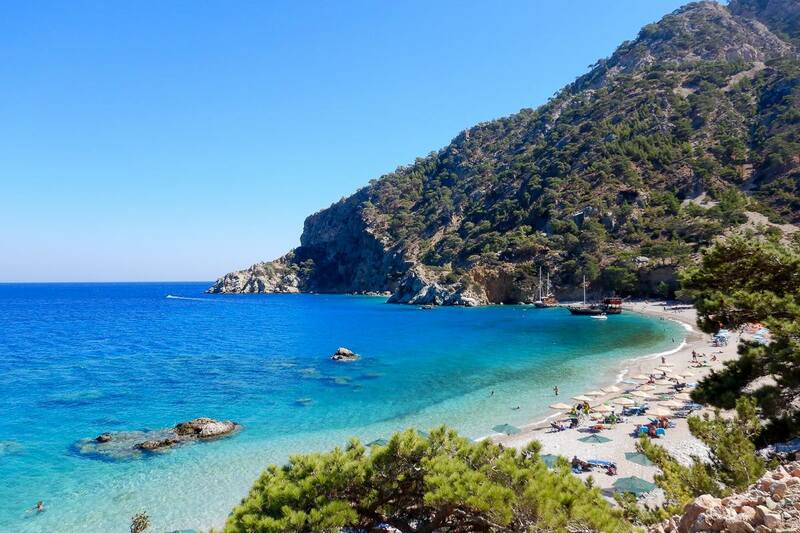 Altogether, Karpathos has about 75 distinct cove beaches, most accessible by car. The locals, of course, have their favorite spots apart from those on the map. We toured with the wooden ship, Sofia My Love, a vessel we highly recommend. Not only is it filled with good humor and kitschy pirate décor, but calls at a private little cove where lunch was served in a grove of pine trees. 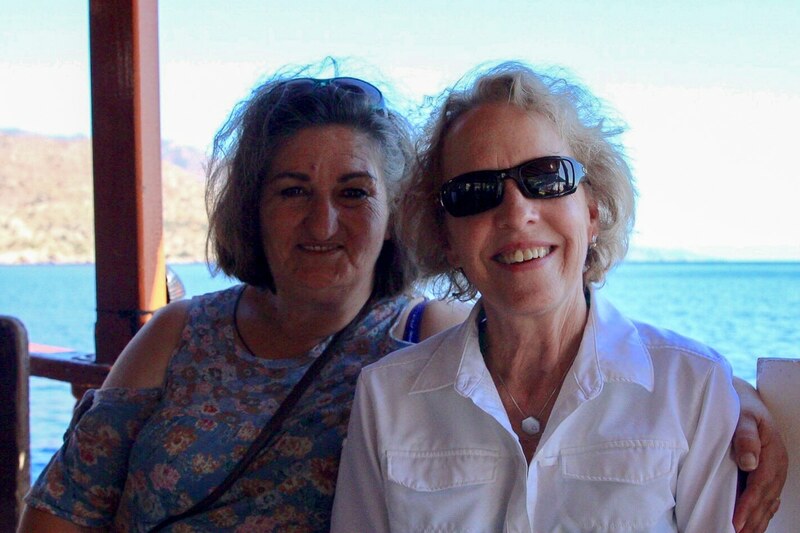 Owners Vassili and Sofia love to share their story, and commented, too, on the close connection with the States. Other beach stops included Apela Beach, where we walked a short distance to visit the Byzantine Church of St. Lukas, and the cove at Kira Panagia, a picturesque point where we entertained ourselves by diving off the ships gangplank. Sofia of the wooden ship bearing her name was among those who acknowledged the United States’ role in Karpathos’ current success. Hiking. The island has about 150 miles of marked trails. Birding. Over 200 species to discover along a dozen routes. Windsurfing and Kite Surfing. An international favorite spot along the windy southern shores. Find classes at Agrilaopotamos Beach in the southwest. Or, for beginners like me, check out lessons in Chicken Bay. Diving and Snorkeling. The clear waters showcase rock formations and some sunken ships, but this isn’t necessarily a colorful fish haven. Climbing. Where there are rocks…. Mountain Biking. Plenty opportunities here for trail blazing. Yoga. Stretch it out with the view of your choice. Either mountains or sea are enhanced by the constantly changing light. Our stay was entirely at Alimounde Mare, a large hotel with complete resort services, including a beautiful infinity pool, spa, full restaurant, and nice views overlooking the pool and bay. It’s an easy walk to Pigadia shops, restaurants, and port. Several new hotels are under construction in Pigadia, and there are assorted hotels and villas to rent all around the south of the island, including in Amoopi, Arkasa, and Finiki. OMG, the food. Consistently fresh and delicious. We had so many great meals where the food never seemed to stop. The best way to eat is to order plates to share. The fare usually included some combination of these favorites: Greek salad with tomatoes, peppers, onions, cucumbers, olives; fried zucchini, spinach pie, cheese topped with honey and sesame seeds, olive tapenade, eggplant, calamari, shrimp, souvlaki, and fish or lamb. Local olives, olive oil, salt, oregano and honey are not only popular souvenirs, but dearly regarded by locals–and shipped in bulk to American homes. 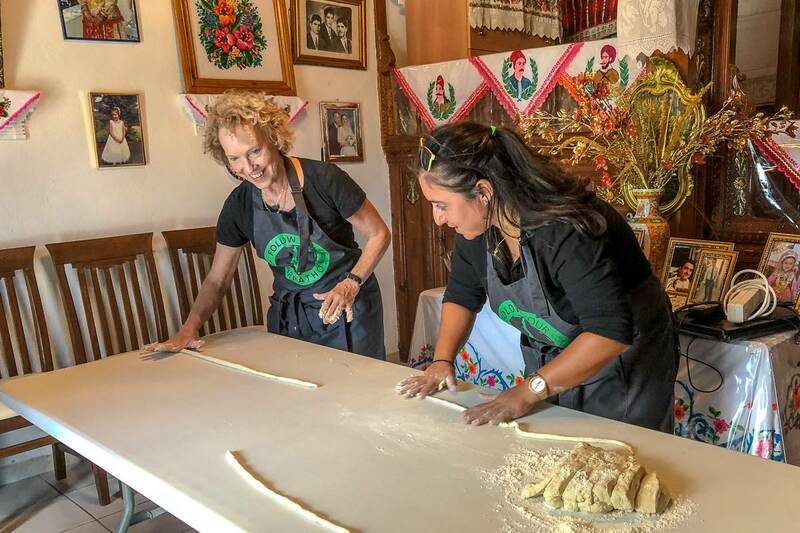 With Evangelia, founder and owner of Ecotourism Karpathos, trying to keep up making little makarounes–pasta cooked with onion carmelized in goat butter. Taverna Under the Trees. (between Lefkos and Mesochori) The ideal spot in Greece, as everyone will agree, is “the taverna under the trees by the sea.” This restaurant fits the bill and serves wonderful food. This was my favorite meal of the visit. Two salads and all the shared dishes topped off with lamb and cod prepared perfectly. Even better, we shared the meal with Michalis and his parents Popi and Yannis and extended family from Maryland. The owner, Kosta, lived in New Jersey before returning to the island. Maxim. (along the port in Pigadia) I can see why the Dutch couple were celebrating their 28th wedding anniversary here. They’d spent 20 of those years living in Karpathos. Pelagos. (central Pigadia) Good restaurant with live music and a dance floor enjoyed by locals and expats. This seems to be the place to hang out: at the next table was the famous Danish singer/songwriter Engelina Andrina Larsen. Pelagos owner Chronis Panared can be found on stage, too. Music nightly. Rina’s. First stop from the airport, this family operation also offers views to the windsurfing area to the south. Erasmias Grill. Fill up with delicious quick salads, souvlaki, or pita sandwiches. Loads of food for under 10 Euro. A parting shot: this sunset over Lefkos. While we watched the sun set here, we also kept and eye on the moon rising behind us. As we covered Karpathos Island (and thanked our lucky stars that we could spend the duration of our visit on this one island), I was particularly encouraged chatting with Michalis. He and other young entrepreneurs are working enthusiastically to build tourism in Karpathos, while protecting the island’s unique culture and natural environment. Changes will come quickly: Hotel room capacity will increase 10% by 2020, to 5,500 rooms. Cruise traffic will increase, but so far only the small ship enterprises match the harbor and infrastructure. On this trip, everything from our hotel and meals to transportation and excursions was organized by Holiday World Karpathos Travel. Thanks to them and to all the partners who took us in, showed us their homes, and engaged us with their personal stories. Check in with Evangelia Agapiou of Ecotourism Karpathos if you’re interested in a hike. The island has about 30 signed trails, and a guide will help you spot rare birds and botanics. If you want more fuel for your imagination, check out the KarpathosApp. Then call on Michalis and his mother Popi–a family business–to embrace the Karpathos Island lifestyle. Note: Our travels in Karpathos were hosted by Holiday World Karpathos Travel and the tourism committee of the municipality of Karpathos. What a great introduction. The opinions here are my own, of course, as is the desire to return for an extended stay. We’re eager to spread the word about Karpathos in Greece’s Dodecanese Islands. If you like this post, please share or pin, using the buttons above. Check out our 2014 hiking experience in Meteora, Greece, here. And look for a new post on Athens coming soon. Thanks for sharing your tour experience of Island. I read your post. …Your post is very beneficial for every reader including me. You have mentioned the good picture of the best-visiting places [on the] Island. Thank you! I hope you will visit Karpathos to see for yourself. Will you be attending the adventure travel conference in Bhopal in December? Karpathos invited the right person to give visibility to this hidden treasure. Thanks for all the information and beautiful photography. Most compelling was the obvious warmth of the people! Thanks, Irene. I felt so lucky to be there and see how enthusiastic the locals are as they take first steps in developing tourism. Such a great report on another gem in Greece’s crown. So much of what you’ve described about Karpathos could easily be used to describe so many places in Greece, including our Peloponnese: family, the connections, the music and culture, the vast talents of those who still craft articles and the many things to do. . .glad you had a chance to experience why we find Greece so magical!! Your post is beautiful. Yes, I’m a convert! I’m glad you could identify with my experience, and yes I would love to investigate more, including a visit to your Peloponnese neighborhood. I will continue to follow your travels and home life. I don’t think I’ve ever heard of Karpathos Island. It looks so beautiful — I love the rugged beauty of the mountains running right down to the shore, and the beach looks like someplace I’d like to spend time. Thanks for the intro! You are absolutely right, Patti. The contrasting colors and terrain from the water up to the mountains was mesmerizing. There’s no shortage of good look-out points! Thanks so much for this glimpse of Karpathos Island. I had not previously heard of it, but looking at your terrific photos makes me want to pack my bags and head there. I thought I was the only one who hadn’t heard of Karpathos. Even the “Dodecanese Islands” was a new term to me–for that group down in the southeastern Aegean. So all the history of this place was all the more interesting to me. Greece is on my travel list. While I have been, tom has not, and there are lots of places that I did not see when I was there 30 years ago. I never heard of Karpathos Island and that is strange if it is so American, and tourism is a major income source. The summer temps sound lovely, but I want to know the winter and spring temps. Karpathos sounds like it has diverse terrain – that is something I like when choosing an island to visit, as well as scuba diving. When we go to Greece, I will check it out. I bookmarked your post for future reference. That would be so cool if this prompts you to visit Karpathos. The winter temps, by the way, are in the 50s; by April in the 60s. It’s certainly mild enough that is attracts a fair number of northern Europeans year round. I completely agree: the diversity of terrain and protected species will be my main reason for returning.